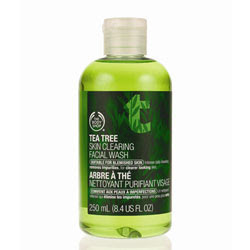 Firstly I try to buy The body Shop Tea Tree Skin Clearing Lotion (bought online). I used this as a moisturizer. One tube can last for almost 2 months. After the first 2 months, I realize my acnes are slowly reduced. 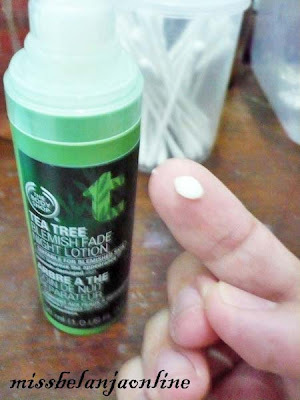 Because of that good result, I decided to buy more from tea tree line. When I visited their store on last September, I bought a tea tree package which contains Tea Tree Cleansing , Tea Tree Skin Clearing Lotion, and Tea Tree blemish fade night cream. It all came with a green pouch as a wrapper. 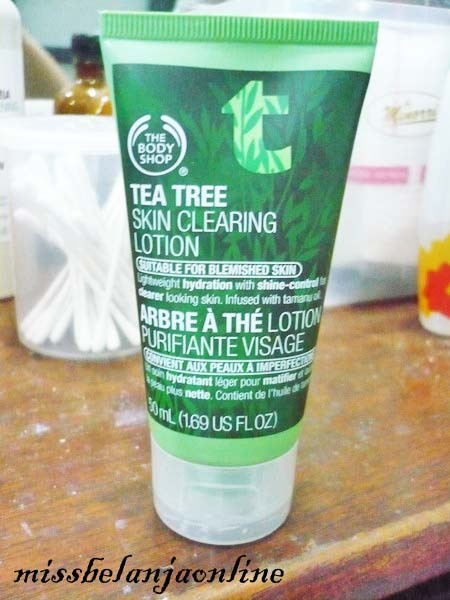 The Body Shop Tea Tree Skin Clearing Lotion. From the website: A beautifully light and moisturising lotion that sinks into the skin to hydrate and help clear and prevent blemishes. This lotion also contains powders for shine control. Skin appears matte. I love it because: Reduce my acnes also make my skin smooth and clear. I Hate It Because: The lotion quickly dry in the open air. From the website: A cleansing gel-based facial wash, suitable for everyday use to help clear and prevent blemishes, removing excess oil without overdrying the skin. The night cream is used after I cleanse my face at the night. This product is hard to get In Indonesia. I don’t know because it already sold out (everytime I want to buy??) or maybe other reason (The Body Shop Indonesia's site also don't have this product on their listing). Back to review, I love this cream. 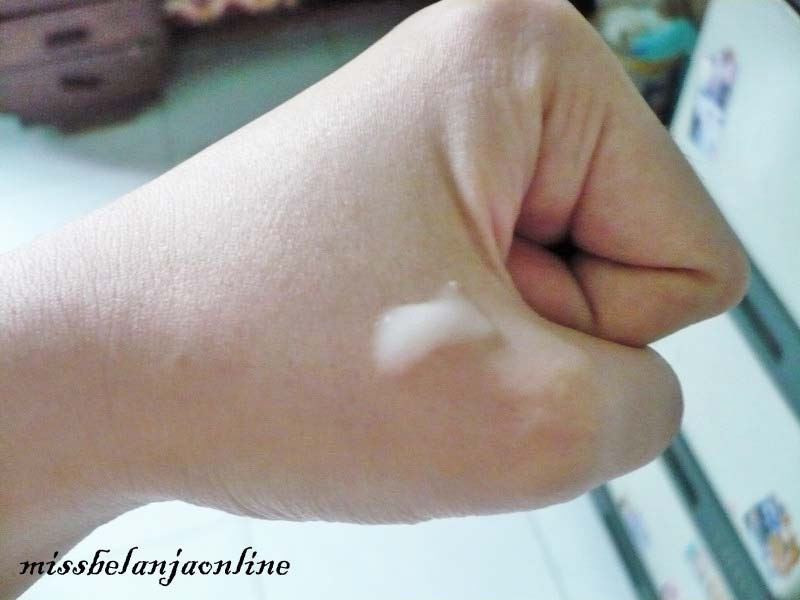 It doesn’t make my face oily in the morning, and I found my blemish is more fader. The cream not really to thick and absorb quickly. If you buy package like mine, it cost me IDR 379.000 including the pouch. Klo udah pake skin clearing lotion masih bisa pake bedak lagi ga? 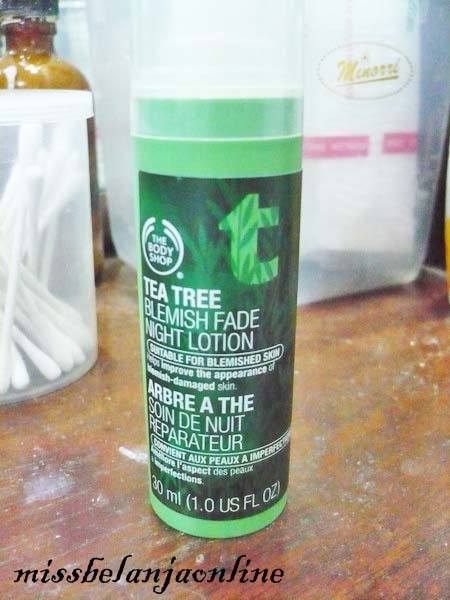 Wow, gw juag lagi pengen nyoba yang Night Lotionnya :), btw gw pakai yang TEA TREE SKIN CLEARING TONER dan udah direpiewww, bagus banget, ngurangin jerawat euyyyy. hai sist, saya pake facial wash sama blemish fade night cream nya juga, tapi belum berhasil blm ilang juga ini jerawatnya..mungkin karena gak pake lotion moisturizer nya kali ya..huhu..bsok beli deh..
oya sist itu kurun berapa lama bisa keliatan menghilang blemish bekas jerawat di wajahnya? 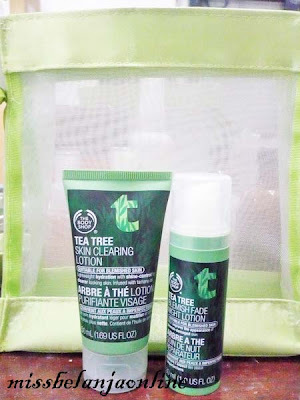 Hello, kamu pengguna Skin Care dan Cosmetic dari The Body Shop juga ya? Tolong bantu aku dong isi Survey-ku tentang skin care dan cosmetic dari The Body Shop sebagai syarat sarjana hehehe. Thank you so much, merci beaucoup, terima kasih banyak!!! Sis itu harus smua nya? Atau bisa pilih salah satu nya aja? tergantung sis, kalau mau pakai salah satu juga bisa kok. cuma kebetulan aku pakai semua. 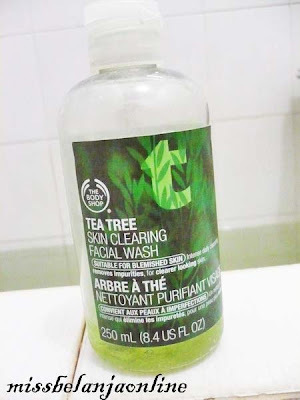 bedanya creamy wash sama facial wash tea tree series ini cuma teksturnya aja kan sis? Iya say :) yg facial wash teksturnya gel..